There’s something we should make clear at the outset: turtles are not low-maintenance pets. Nor are they ideal for children. To keep turtles properly you need large tanks, special lighting, good filtration and lots of cleaning. Needless to say, some kids have neither the interest nor ability to provide the sort of care turtles deserve. Another important consideration. Turtles enjoy quite lengthy lifespans, some 40 years for many Australian natives. And they grow relatively large, at least 30 centimenters long. Hence the need for large tanks. That said, turtles make beautiful, fascinating and rewarding pets for those willing to commit the time and effort necessary. If you’re interested, the first step is to check out the species available and the care requirements of each. The most commonly kept turtle in Australia is the eastern long-necked, which, as its name suggests, is found in Queensland and New South Wales. And has a long neck. 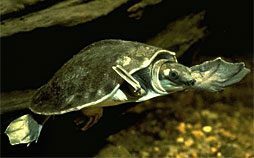 You may also come across the Sydney Basin and several other short-necked turtles of the same genus, the northern snapping turtle, the Murray River (or Australian snake-necked) turtle, the pig-nosed turtle and the rare and endangered Mary River turtle. We should add that it is illegal to take any turtle from the wild. 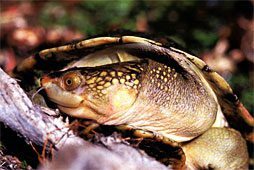 Licenses – As with snakes and lizards, you will need permission from the Department of Environment and Conservation to keep turtles, in this case a Class 3 licence. The principal requirement is demonstrated experience in keeping reptiles (sounds bit ‘Catch 22,’ doesn’t it?). For more information, phone the National Parks & Wildlife Service on (02) 9585 6444 or check out the website of the NSW Department of Environment and Conservation. 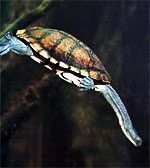 Housing – An aquarium about one metre long will be fine for small turtles. Because turtles need an area for basking (as opposed to busking), you can slope the bottom using aquarium gravel, add smooth, flat rocks or bricks or buy a purpose-built turtle ramp. Just as long as you make it easy for your turtle to get out of the water; turtles are not noted for their jumping ability. The water should be deeper than your turtle is wide so that it can roll over without getting caught. Water quality. Hygiene is critical. 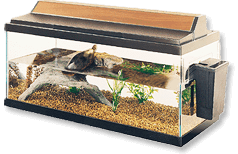 Since turtles are naturally quite messy, you will need a good filtration unit to help maintain water quality. To reduce disease, the pH should be kept at a neutral level between 7.4 and 8.0. As well, the tank will need regular cleaning with 25% of the water being changed every week. Heating. When temperatures are too low, turtles either don’t eat or don’t digest their food properly. In winter they could even go into hibernation, very dangerous for young turtles. An electric glass tube-type heater with a built-in thermostat will maintain the water temperature within the desired range of 23° to 26°C. Lighting. Turtles need ultraviolet light for proper shell formation (see Health problemsbelow). This is one instance where artificial is better than natural. If you were to place the aquarium in direct sunlight, you’d run the risk of the water becoming hot enough to actually kill your turtle. Even though UV lights might be showing visible light, they have a limited life. The best idea is to replace them every six to 12 months. Turtles also need a discernible day/night cycle. A lighting fixture with a white incandescent tube mounted along with the UV light in the lid of the enclosure will do the trick. Just remember to turn this light on and off according to light conditions outside. Feeding – The first thing you should know is that turtles only feed in water. Because young turtles grow rapidly, they need a wide variety of nutritious foods to help prevent deformities and produce a strong shell. Suitable foods include raw lean meat, raw fish, mealworms and chopped earthworms, pond snails and mosquito larvae (wrigglers). They should be cut into five to 10 tiny pieces and given along with commercial turtle pellets. The latter float on the surface, making cleaning a good deal easier. Feed young turtles daily for the first few months, decreasing the frequency to three times a week by the time they reach two years of age. Remove uneaten food after one hour to help prevent the water from fouling. To further cut down on the mess (and your cleaning time), you might consider feeding your turtles in a separate plastic tub. Establishing water plants provides a home for small invertebrates like wrigglers, which adds some sport to your turtles’ mealtimes. And adding a slow-release sulphur block will help prevent common bacterial and fungal diseases. Shell Rot. This problem occurs when the turtle’s breastplate (plastron) is scraped, usually due to rough basking rocks. The resultant abrasions then become infected with water-borne bacteria. Naturally, this problem will be exacerbated by unhygienic pond or tank water. The signs: yellow becoming red discolouration of plastron • softening and necrosis of the shell where discoloured • deep ulcers which can go through bone of the shell and perforate the coelomic cavity. Using a soft cloth or soft-bristle toothbrush, the infected tissue shell must be cleaned and debrided (nothing to do with marriage annulments) with dilute povidine iodine or chlohexidine. Lesions should then by dressed daily with Silvazene® cream. Where there are deep ulcers, general anaethetic may be necessary for thorough cleaning. In such cases a two-week course of antibiotics coupled with fluid therapy will likely be necessary. 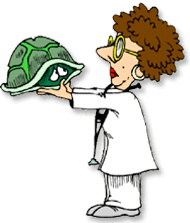 Except for feeding, you should keep your turtle dry for the duration of the treatment. You should also smooth or replace all rough surfaces in the pond or tank and ensure the water is clean and filtered. Metabolic Bone Disease. Unfortunately, this problem is both very common and quite serious, especially where turtles are housed indoors without sufficient exposure to ultraviolet light. Another contributing factor, particularly in young, growing turtles, is too little calcium in the diet. This deficiency eventually leads to a weakening of the bones and shell. The signs: soft, pliable bones and shell • grossly distorted carapace • distortion of the backbone • weakness and inability to lift itself • paralysis of hind limbs • eyeballs slipping out of malformed orbital rim • tremors and seizures. We’ll probably be able to diagnose this disease through a physical examination but may also need radiographs and blood calcium tests to be sure. Treatment begins with either weekly calcium injections for four to six weeks or oral supplements for two to three months. At the same time you should be correcting your turtle’s diet, adding more whole-prey items, dark green, leafy vegetables or calcium powder. Daily exposure to unfiltered sunlight or a U/V light are the best ways to promote production of Vitamin D. And you should ensure your turtle is housed so that it can not climb and possibly injure itself. More information – We have covered some of the more important considerations for owning a turtle on this page, but there’s a lot more you should know. We suggest reading Care of Australian Reptiles in Captivity by John Weigel and/or joining a herpetological society. And, of course, you can call Bryn Lynar, our resident reptile vet.